Copyright 2015 The El Messiri Project Authors. El Messiri is a modern Arabic typeface family designed by Mohamed Gaber (Arabic) that began with Jovanny Lemonad’s Latin and Cyrillic typeface Philosopher. The Arabic started with the concept of a curvy Arabic typeface inspired by the beauty of Naskh and drawn as if with a brush instead of the traditional bamboo pen. The idea took form with wide counters that improve readability at smaller text sizes, and has subtle details that make it a great display face at larger sizes. 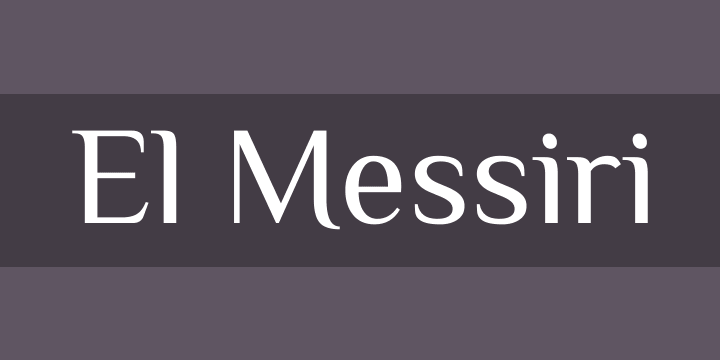 El Messiri current comes in 4 weights (Light, Regular, SemiBold and Bold) and the Arabic component has a wide glyph set that supports the Arabic, Farsi and Urdu languages.